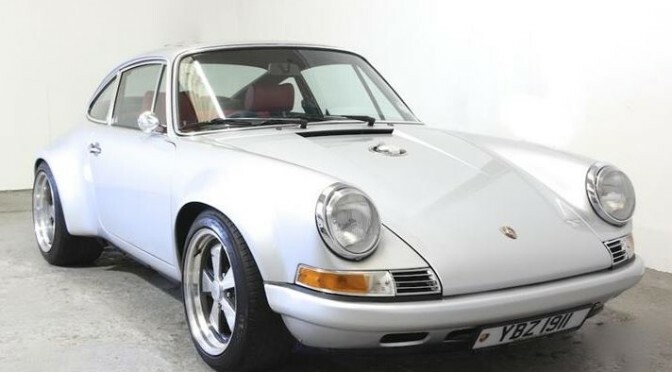 Here’s a stunning Porsche which has been inspired by the exotic American Singer 911s and it’s a real eye-catcher. 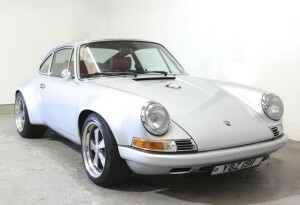 Based on a 964 Carrera 2, the car has been backdated with handcrafted steel panel work. 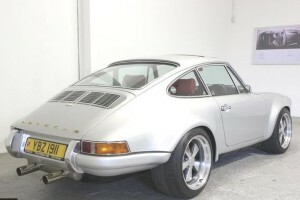 The front wings are S/T items while the rears are RSR, and the bumpers are smooth pre-1973 items. The detailing is all pre1973, too, with polished alloy window frames, early 911 door handles, period lights front and rear with chrome front intakes and a single polished door mirror. A very cool feature is the centrally mounted racing fuel filler in the bonnet. The 964 suspension has been updated with Bilstein dampers behind stunning 17-inch Fuchs-style wheels – 9-inches wide at the front and 11-inches at the back, shod with Michelin Pilot Sport Cup tyres. The brakes are new 964 items. If the exterior is impressive, wait until you get inside. The 964 cockpit has been transformed. Lightweight period Recaro seats are clad in basket weave red vinyl and leather with matching door panels and rear seats. The steering wheel is a lovely Momo Prototipo while genuine 911T basket weave also adorns the dashboard. The radio is a retro-look Caliber unit with all modern conveniences and linked to uprated speakers front and rear. The red theme continues in the luggage compartment which is upholstered in sumptuous quilted red leather. The engine is a standard 964 unit but because the car is lighter than standard at just 1265kg, it feels more nimble than a 964. The exhaust is a custom Hayward and Scott system which sounds fantastic without being intrusively loud. The car was the subject of a major feature in the August 2013 issue of 911 & Porsche World magazine.